Grapevine embryogenic cultures are ideal target tissues for inserting desired traits of interest and improving existing cultivars via precision breeding (PB). PB is a new approach that, like conventional breeding, utilizes only DNA fragments obtained from sexually compatible grapevine plants. Embryogenic culture induction occurs by placing leaves or stamens and pistils on induction medium with a dark/light photoperiod cycle for 12–16 weeks. Resulting cultures produce sectors of embryogenic and non-embryogenic callus, which can be identified on the basis of callus morphology and color. Somatic embryo development occurs following transfer of embryogenic callus to development medium and cultures can be maintained for extended periods of time by transfer of the proliferating proembryonic masses to fresh medium at 4–6-week intervals. To demonstrate plant recovery via PB, somatic embryos at the mid-cotyledonary stage are cocultivated with Agrobacterium containing the desired gene of interest along with a, non-PB, enhanced green fluorescent protein/neomycin phosphotransferase II (egfp/nptII) fusion gene. Modified cultures are grown on proliferation and development medium to produce uniformly modified somatic embryos via secondary embryogenesis. 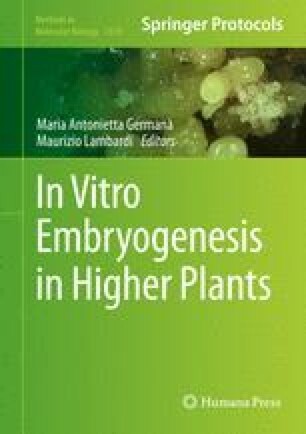 Modified embryos identified on the basis of green fluorescence and kanamycin resistance are transferred to germination medium for plant development. The resulting plants are considered to prototype examples of the PB approach, since they contain egfp/nptII, a non-grapevine-derived fusion gene. Uniform green fluorescent protein (GFP) fluorescence can be observed in all tissues of regenerated plants. S.A. Dhekney holds the E.A. Whitney Endowed Professorship in the UW Department of Plant Sciences. The research that enabled the Precision Breeding approach for grapevine was fostered by long-term support from the Florida Department of Agriculture and Consumer Services Viticulture Trust Fund, the USDA Specialty Crops Research Initiative Grant Program, and the Florida Agricultural Experiment Station, UF/IFAS.